Needless to say, pastels are this season's 'IT' trend, polarising the sartorial world over this winter. 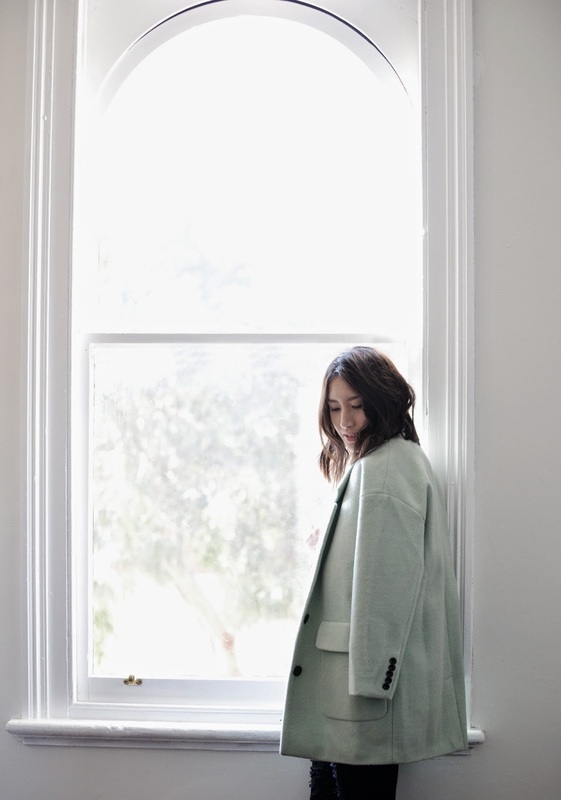 Navigating this trend with ease can be tricky so I've come up with two ways you can transition a spearmint-hued coat (because let's face it - mint is the new cotton candy pink) from winter to spring. Anchoring a soft mint hue with bright white keeps the look fresh, modern and sophisticated. I've also juxtaposed the structured silhouette of the coat with the more languid, casual sensibilities of the oversized shirt dress. The contrast in textures, colours and shapes lends an unpredictable take on this oft-tricky trend. The key here is to also keep your accessories to a minimum. Less is always more - sleek pumps, bare legs (when the weather permits! ), an oversized mens' watch and a pair of classic sunglasses is really all you need. Shop the look: Tiffany Drop Shoulder Mint Oversize Coat | Cali Poplin Shirt Dress (both items worn above are a size M). Teaming spearmint with black denim (and sticking to a simple colour palette) gives way to an ensemble that can take you from day to night with ease. It's equal parts effective and relaxed chic. The distressed detailing on these jeans is also the perfect, edgy antidote to the primness of the coat. Shop the look: Tiffany Drop Shoulder Mint Oversize Coat | Cali Poplin Shirt Dress | Emmanuelle Distressed Skinny Jeans (I'm wearing a 27 above). Have a great weekend! Lovely post indeed. HELLO PARRY is an online boutique based in Perth, Western Australia, dedicated to offering a select collection of designer and street inspired pieces for the ‘fashion forward’ at affordable prices. All content is © 2014 by HELLO PARRY unless otherwise stated. Simple theme. Powered by Blogger.